Full ounce gold coins are expensive – well over $1000 each now. If you want to start collecting gold bullion coins but can’t afford to start with full one ounce coins, remember you can also get smaller coins – in one-tenth, one-quarter and one-half ounce sizes. Though these attract a higher premium over the spot price of gold than the full ounce coins, they are a good way to start collecting your gold. Fractional sizes are available for most popular bullion coins, including gold Eagles, Maple Leafs, Krugerrands, Austrian Philharmonics, and Chinese Pandas. A few 1/20th ounce coins are now on the market too (Pandas, Maple Leafs and Kangaroos) as well as coins as small as 1 gram (less than 1/30th of an ounce). 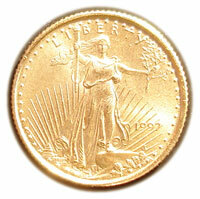 Apart from the lower price, are there any other reasons to buy fractional gold bullion coins? Well, they make wonderful presents. Also, they are fairly rare coins and hard to get, since they are generally minted in lower numbers than the full one-ounce coins. All official bullion coins issued by different countries are different from year to year – they at the very least have a different date, and often they have a different design. For this reason, they are becoming collector items with a numismatic value, as buyers want to add every coin issued to their collections. Though this makes them more expensive now, they are likely to hold and increase their value in the future, and their markup over the gold spot price may well rise more as time passes.